Lavish beauty of the snow-capped mountains in the surroundings along with jade meadows that blend together to make a fantastic valley of flowers Uttarakhand package.Get in touch with our travel experts at WaytoIndia now! One of the most beautiful destinations in the world, Uttarakhand lets you refresh your mind, body, and soul. 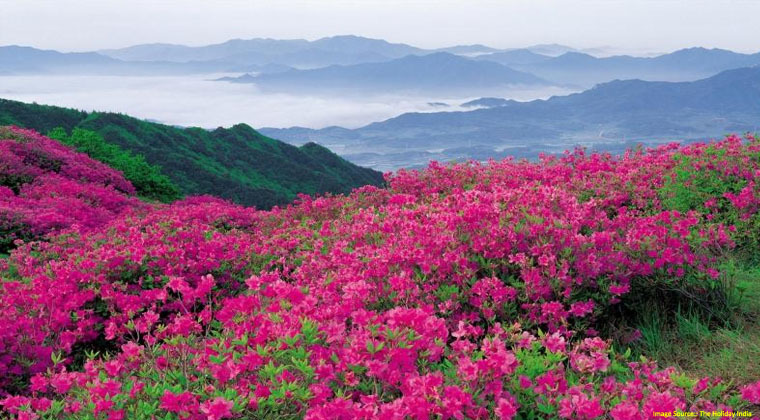 WaytoIndia’svalley of flowers Uttarakhand package gives you an opportunity to be tucked up at a soaring altitude. Your vision will be blessed with bizarre flowers, faunas and splendid views. Besides providing pilgrimage opportunities by taking you to Haridwar, Hemkund Sahib, and Joshimath, this holiday tour also lets you explore various splendid hill stations like Rishikesh, Rudraprayag, and Ghangaria. You can indulge into yoga at the ashrams in Rishikesh like ‘The Beatles’, sink in the tranquil beauty of the valley of flowers and embark on a trek and undertake various other adventure activities. Be familiar with this colossal beauty which offers you the most stunning outdoors you may ever envision by viewing our in-depth day to day itinerary. Your valley of flowers Uttarakhand packagestarts with arrival in Delhi. As soon as you arrive, you will be escorted to Haridwar by road. Let the eagerness build up, as you travel through the hilly roads.People from all over India visit this spiritual place and take some divine dips into the holy river Ganga. On arrival in Haridwar, quickly check in to the hotel and freshen up as today you will be exploring one of the seven most divine places. First, you will be visiting Haridwar’s holy Ghat which is popularly known as Har Ki Paudi. It is a sacred bathing ghat in Haridwar where mystical events take place. This ghat masses the marvellous Kumbh Mela, during which many people have a bath in River Ganga.The place houses the foot imprints of Lord Vishnu on one of the stones of the ghat. Later you can walk around Har Ki Paudi’s elegant markets and put your bargaining skills at work. In the evening, be present for the rituals thatwill be performed by the priests on the banks ofRiver Ganga. Here you will have adelightful and sanctified experience with the graceful lamps floating into the water. In addition to this, the sounds of echoing mantras will fill the atmosphere which will have your mind calm down from worldly matters and let you get engrossed in the flow of chants. After tasting this divine beauty, you will head back to the hotel for overnight stay. After having some aromatic breakfast on the second day of your valley of flowers Uttarakhand package, head to Joshimath – one of the most sacred towns.Snuggled with love in the Chamoli district of Uttarakhand, this celestial place is admired by the Hindus for being a vital pilgrimage centre of the country. En-route, halt at the holy sites of Rudraprayag, Devprayag and Karnprayag. Named after Lord Shiva, Rudraprayag lies at the convergence of two rivers, namely Alaknanda and Mandakini. The small town will bless your eyes with majestic views. Visit Kedarnath temple if time permits. Devprayag is set amidst the rolling Himalayan ranges and Ganga technically flows from here when rivers Bhagirathi and Alaknanda meet to form the sacred river. Karnprayag is home to Uma Devi Temple along with lush green hills at the background and a foaming white river. After sinking in the beauty of these places, head to the hotel in Joshimath and spend the overnight there. Get yourself ready for an eventful day on the third day of this valley of flowers Uttarakhand package. You will need your energy so have a stomach filling breakfast and head to the small majestic village of Govidghat. It is a beautiful hamlet which is popular among pilgrims and also adventure enthusiasts as it is the starting point of the trek to valley of flowers. Start trekking to the beautiful Ghangaria village which is 14 kms from Govidghat and 10,200 feet above the sea level. It is the last human habitation centre you will come across on this trek. 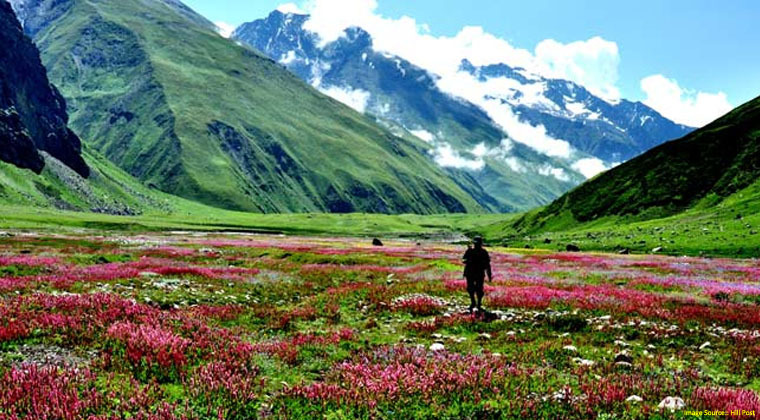 The valley of flowers trek difficulty is from easy to medium and hence can be undertaken by one and all. Once you reach the base camp in Ghangaria, check -in at the hotel and relax for the evening. Spend the overnight after savouring a lip-smacking dinner meal. On the fourth day of the valley of flowers Uttarakhand package tour, have breakfast and regain your energy for the trek to Hemkund Sahib. It is a highly revered place of worship for the Sikh community and the dizzying height of 4636 m is what makes it even more popular. On your way to the gurudwara, the attractive views of glorious Himalayas, cascading waterfalls and verdant dense forests will leave you bewitched. On finally reaching atop, take in the view of the only pentagonal gurudwara in the world. The Hemkund Sahib was once a meditational ground of Lord Laxman as per the devotees and you must take a dip in its holy waters. Return back to the hotel in Ghangaria and spend the overnight in the comfort of the cosy room. 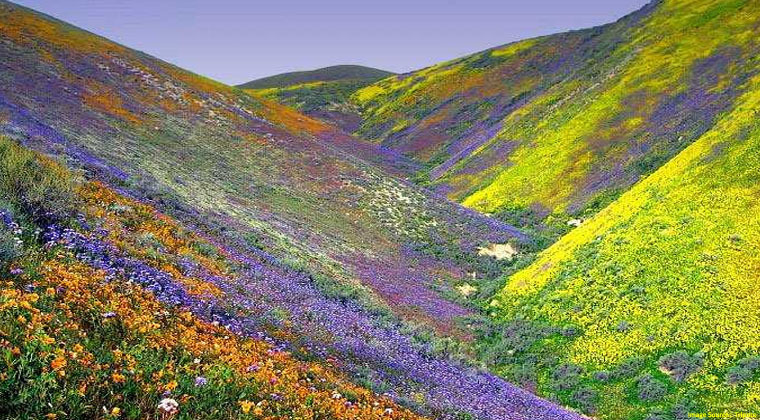 Valley of flowers is a secret jewel situated at an elevation of 3250 meters. The valley is a vibrant and splendid national park and is a dwelling to several rare and scarce varieties of animals like Asiatic black bear, snow leopard, blue sheep, etc. The trek is known for its mind-blowing meadows of endemic alpine flowers and the diversity of flora. It covers an area up to 87 sq. km. and is a UNESCO World Heritage Site. Post breakfast at the base camp, head to explore this wonderland that lures thousands of nature lovers, avid photographers and adventure junkies every year. It is also popular among pilgrims as this is the place where Lord Hanuman obtained the sanjeevani herbs for Lord Laxman. Return back to Ghangaria base camp in the evening for an overnight stay. On this day of your valley of flowers Uttarakhand package, have an early morning breakfast and go on board to trek and descend down back to Govindghat. On reaching the quaint village, transfers to Rudraprayag will be arranged for. Treat your eyes to the splendid views as you drive from Govindghat to Rudraprayag. On arrival, check in at the hotel and relax for the rest of the day. If you wish, you can visit the Koteshwar Mahadev Temple (open 6 a.m. to 5 p.m., no entry fees). It is set on the banks of the Alaknanda River and the temple is in the form of a cave. Devotees believe that the idols here are formed naturally after Lord Shiva meditated in the cave on his way to Kedarnath. Taking back this once in a lifetime experience, you head back to the hotel for a comfortable overnight stay. The seventh day of your valley of flowers Uttarakhand package commences with a delicious breakfast, post which you will embark on a journey to Haridwar via Rishikesh. Your journey to Haridwar is incomplete without catching on all sightseeing spots in Rishikesh. Cross the Ram Jhula and Laxman Jhula, two iron suspension bridges laid across the river Ganges. The gushing water running below while you cross the bridge will give you a thriving experience. Next, head to Neelkanth Mahadev Temple (open 6 a.m. to 7 p.m., no entry fees). History states that Lord Shiva drank the poison tossed from the oceans which turned his neck blue. The temple is situated on the same location where this event took place. Continue the journey and once you reach Haridwar, check in at the hotel and relax. In the evening, visit the Chilla Wildlife Sanctuary (open6:00 a.m. to 6:00 p.m.; entry fees INR 150 / 600 for Indians / foreigners). Ithouses tigers, small cats, elephants, bears and also various migratory birds can be spotted here. Return back to the hotel and spend the overnight comfortably. Finishing your last breakfast on this valley of flowers Uttarakhand package, you head back to the airport.You wish for the days to never end, but unfortunately your vacation tour comes to a halt here. With all the memories and heart filling experiences, you head to the Delhi airport to catch a flight back home. The preeminent time to opt for this package is just a little before rains, i.e., April to June. The summers can be a little scorching but the city receives mild showers and the melting of snow fills the river, making it an apt time to opt for water sports. 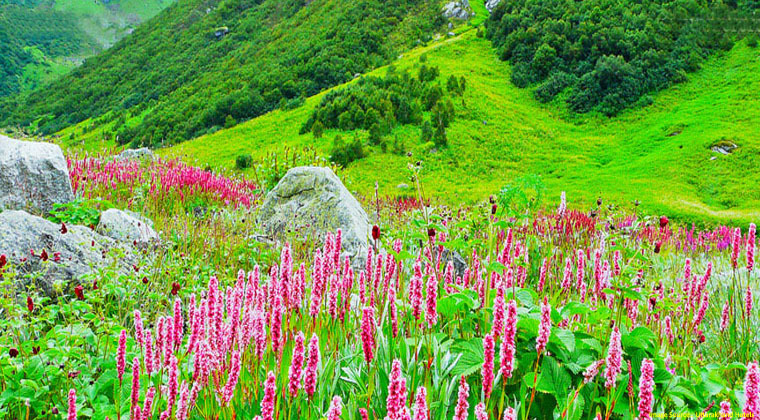 In case you wish to go for a trek, this is the best time to undertake it as per the views of the valley of flowers tour operators. Bungee Jumping: Experience jumping from India’s first fixed platform for bungee in Rishikesh. At a height of 83 m, highest in India, take a sneak peek into the mountains and its virgin greenery. In the end, you also get a video that captures your experience entirely along with a dare to jump certificate. Mountain Biking: Mohan chatty, 8 km away from the main town, is where you can taste the experience of mountain biking. Go pedalling through the picturesque and charismatic scenery and take in the views of clear cobalt blue skies while breathing in the crisp mountain air. River Rafting: Rafting in Rishikesh has received much admiration among the adventure junkies from all across the globe. Challenge your strength, stamina and adrenaline while sailing through the gushing water of River Ganga. Shopping in Delhi and Rishikesh is blissful. Make sure to buy ethnic jewelry, earthen pottery, handmade artefacts and colourful woven bags. Carry warm clothes if you are traveling in the winter months. Travel time between these cities can be too much as the drive is for longer durations. Be certain of carrying proper medication for motion sickness, if needed. Pack swimwear and sport shoes if you plan to engage in any adventure sports activities. Carry basic medicines for cold and cough, fever and allergy. A first aid kit always comes in handy. Keep a map and travel guide handy since network coverage in hilly area may be low and accessing Google maps can be difficult.